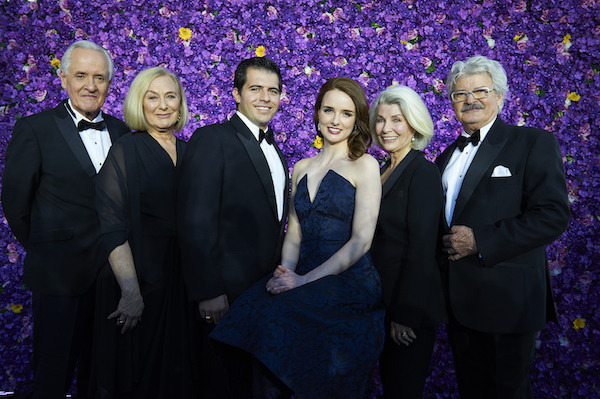 The highly anticipated opening of Lerner & Loewe’s My Fair Lady – produced by John Frost and Opera Australia’s Lyndon Terracini – will open in Sydney on September 6th under the direction of Dame Julie Andrews, who first starred in the musical on Broadway in 1956! Opening night at the Sydney Opera House on 6 September will be the culmination of several years of research to help recreate and present the original Broadway production of My Fair Lady which opened in 1956 starring Rex Harrison and Julie Andrews. Headlining the cast is acclaimed British performer Alex Jennings, as Professor Higgins and the young Australian star, Anna O’Byrne, as Eliza Doolittle. Joining them is Reg Livermore will play the role of Alfred P. Doolittle; Robyn Nevin will play Mrs. Higgins; Mark Vincent will play Freddy Eynsford-Hill; The role of Colonel Hugh Pickering will be played by Tony Llewellyn-Jones and Deidre Rubenstein will play Mrs. Pearce. (L-R): Tony Llewellyn-Jones, Deidre Rubenstein, Mark Vincent, Anna O'Byrne, Robyn Nevin, Reg Livermore. This production will celebrate the 60th anniversary of this beloved musical which took the world by storm, telling the tale of a Cockney flower girl named Eliza Doolittle whose world was forever changed by the brilliant and demanding phoneticist, Professor Higgins. The clash of cultures sparks some of theatre’s most witty dialogue and wonderful songs. Associates of the original design team have come onboard for this production to help bring to life once again the stunning sets by Oliver Smith and glorious costumes by Cecil Beaton. Contributing to the creative team is Tony-award winning choreographer Christopher Gattelli, musical director Guy Simpson, lighting design by Broadway and West End legend Richard Pilbrow and sound design by Michael Waters. Alex Jennings is a three time Olivier Award winner and is one of the UK’s best loved theatre performers. He has worked extensively with the Royal Shakespeare Company and The National Theatre. Known for his versatility, Alex is the only performer to have won Olivier Awards in the drama, musical and comedy categories. He has starred in several films, including The Lady in the Van, The Queen and Bridget Jones: The Edge of Reason. Julie Andrews, who created the original role of Eliza Doolittle in the Broadway and London productions will be taking the helm for this new production and was recently in Australia to hold auditions for the role of Eliza. “I am thrilled to be working with this extraordinary cast and crew. Having the opportunity to meet so many actors during the auditions opened my eyes to the vast amount of talent in Australia. I am excited to welcome lovely Anna O’Byrne and simply delighted that Alex Jennings will be portraying our Professor Higgins. Directing this lovely piece will allow me to honour my mentor, Moss Hart, and hopefully expose a new generation of theatre lovers to this important musical,” Andrews said.